Do you know the lifetime value of your patients? It’s not based on just a handful of appointments. The lifetime value of a patient relies on two things: How many office visits in a lifetime and the number of people they refer to you. As you know, one-time appointment patients aren’t ideal. Your bread-and-butter patients are those who return often and refer you when the opportunity presents itself. So how do you increase your patients’ lifetime value? It’s simple. Keep in touch during the dormant phase of their care. 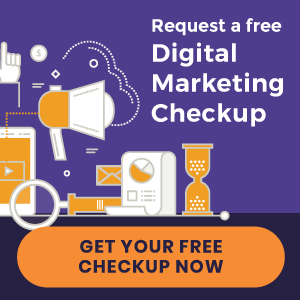 Below, you’ll find five chiropractic email marketing templates you can use to stay connected with your patients throughout the year – whether they are under active care or not. Near Year’s is one of two days each year people tend to think about their health (the other one is listed next). It’s a time when people renew their gym memberships, plan out healthy diets, and vow other acts of self-improvement. It’s a time to hit the “reset” button on their health. Sending a Happy New Year’s email reminds patients they should add a chiropractic checkup to their list of New Year’s resolutions. With the New Year off to a brand new beginning, it’s a great time to start over. Set new goals. Break bad habits. Resolve to become healthier. If you’re thinking about starting a physical fitness program, losing some weight, eating a better diet, or improving some other health behavior, remember your spine! A healthy spine and nervous system should be the starting point of any New Year’s resolution for better health. To start the New Year off on a healthy note, we’re offering chiropractic checkups at a special low fee. We’ll perform a quick check of your flexibility, reflexes, and other aspects of a brief examination. The fee for our brief exam, record update, and necessary chiropractic adjustments is just [$$]. That’s a savings of over [$$]. Resolve to begin the year on a healthy note – and save money too! Our offer only lasts until the end of January, so call now to set your appointment for this popular annual event. Birthdays are the other day of the year people tend to think about their health. 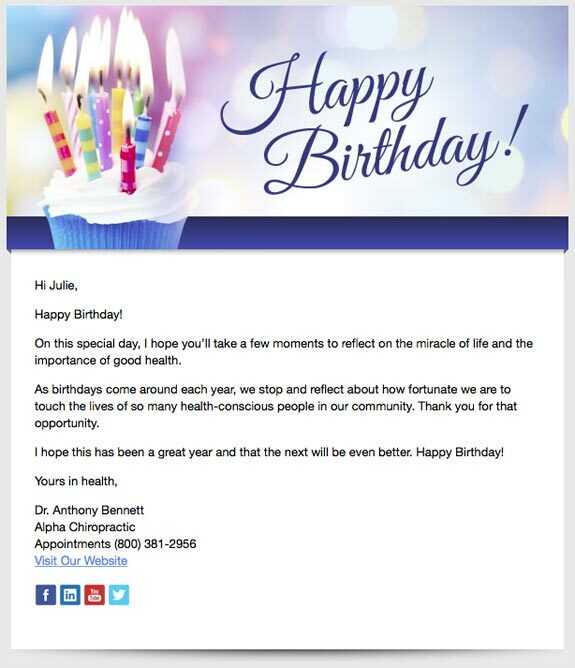 Birthday emails help cultivate more personal relationships with patients. After all, they are personal messages, sent only on the patient’s special day. They can have special significance, especially as we get older and our birthdays are often overlooked. On this special day, I hope you’ll take a few moments to reflect on the miracle of life and the importance of good health. I hope this has been a great year and that the next will be even better. Who doesn’t like holiday greetings? Sending holiday emails to your patients is a simple marketing strategy that reminds patients you are thinking about them throughout the year – which, in turn, reminds them to think about you. On behalf of our team here at [practice name], we would like to wish you and yours a Happy Valentine’s Day! Thank you for entrusting us with your care! You can be confident that we will remain committed to delivering the highest levels of chiropractic care in a warm and friendly environment now and in all the years to come. We look forward to being your healthcare provider of choice, and will endeavor to help you and your family achieve optimal health and wellness! Did you just add a new person to your team? Keeping patients in the loop with the latest developments in your practice helps stimulate patient community. Introducing a new staff member via email is just another way to let patients know you are there to serve them. We’ve added a new member to our health care team. [Staff member’s name] joined us on December 13, 2016 and will be helping us in the capacity of [position]. He/she is a fine addition to our practice. Before becoming part of our team he/she was busy [previous career, hobbies, activities, community involvement, etc]. After growing up in [location], she/he relocated to our area [when]. During the next few weeks while she/he is learning the ropes, we invite you to stop by and say hello. Do you have a promotion for annual checkups? Or some other special you run throughout the year? Every once in a while, it doesn’t hurt to remind patients they should come back and see you. After all, it’s the reason you send them emails in the first place. You might decide to send an annual overture on the anniversary of the date they originally began care in your practice. Subject Line: Time for a Checkup? It’s always a good idea to take a few moments every year or so to evaluate one’s health. Many health problems develop slowly. Without periodic re-examinations little problems can get out of hand and make their correction more difficult. During the next two weeks we’re offering patients we haven’t seen in a while a special Progress Exam Update at the reduced fee of [$$]. It’s a saving of [$$] and includes a brief exam, record update, and necessary chiropractic adjustments! Enjoy the assurance of receiving a “clean bill of health” at a special low price. Just a note, our special Progress Exam Update expires [two weeks later] so call for an appointment today! Keeping tabs on every patient’s birthday, and typing out an email each time their birthday arrives, would be tiresome. Serving patients is a much better way to spend your time. 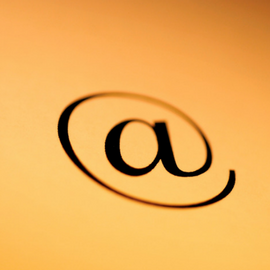 That’s why it’s important to automate your email campaigns. With the right email marketing software, like that which is built into a Perfect Patients website, you can automate these email templates all year long – without you ever having to worry about it. « Panorama Chiropractic and more new websites!